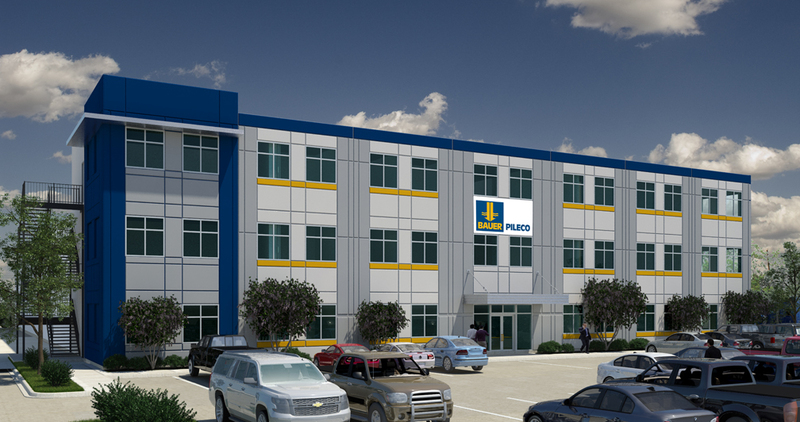 Rendering of Bauer Pileco headquarters, which will be built in Conroe north of Houston. CONROE, Texas – Bauer-Pileco, a global provider of foundation equipment and support to the foundation construction industry, will build a 78,774 SF facility in Conroe Park North for the company’s new North American headquarters. The new location, with three stories of office space, warehouse and service building space, will be built by KDW, the Houston-based design/build general contractor. Construction at the 18.6-acre site is scheduled to begin this fall with completion estimated for the first quarter of 2018. Conroe, which is located about 40 miles north of Houston, is the fastest growing city in the nation in 2016, according to the U.S. Census Bureau, with an annual growth rate of 7.8 percent. Conroe Park North is a 1,045-acre industrial park on FM 3083, two miles east of I-45. Bauer-Pileco’s current North American headquarters is located nearby in Conroe at 100 North FM 3083.